And now for the last layout I have neglected to share. Back in February I hosted a retreat at Kiah Ridge. It was awesome fun and the best bunch of ladies attended. I can't wait to go again next year! 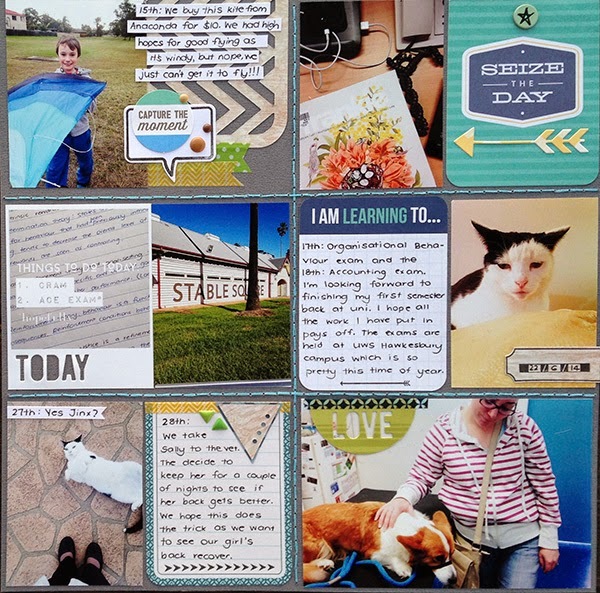 Anyway, Julie from Scrap of Your Life gave me a challenge to use project life cards on a 12x12 layout. I used my awesome CTMH sewing guide ruler thing to poke all the holes into the background and then I just sewed the 'pockets'. This will slot straight into my project life album. I may even do just a normal layout on the other side. We shall see.